A beautiful home with fascinating history. 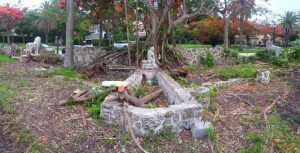 The video takes the viewer on a tour of the residence that was formerly located at 2100 South Miami Avenue. Construction began in 1935 and was completed in 1936. The first family to occupy the home moved into the residence in January of 1937. The documentary is set to music and consists of a sequence of pictures, newspaper clippings and video content. The journey begins in the mid-1930s and concludes in 2017 with the preparation of the land for its future tenants. The property is being sub-divided into five lots as part of a development called Villa Leones. The newer homes are in stark contrast to the palatial home that once resided on the single large lot. See how the residence and landscaping once looked prior to the home’s demolition in the early 1980s. Read the story of La Casa Reposada by clicking here. Cover photo courtesy of Larry Shane Photography.